Featuring a new playable race for the game with many new units and functions. This race is based on the 40k Background and features the imperial guard troops of Armageddon called Steel Legion. The idea behind the mod is to bring in a new strategie game play where units are more specialist and more units can enter the battlefield. You can play the race on your own or face it as enemy in multiplayer games. It's quite balanced to existing races. Current Release Version is 1.5. There is an update to Version 2.0 planned featuring a second new race. This mod is dedicated to the Imperial Guard of Armageddon, better known as Steel Legion for it's armor in the form of tanks. The Steel Legion therefore has access to a wide range of tank variants and can use them very early in game. 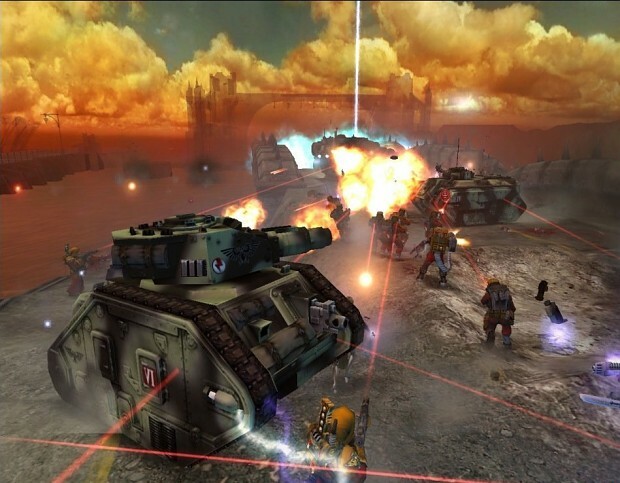 The Steel Legion Mod has been developed as a non-profit extension of the Dawn of War RTS game. This Mod is distributed free of charge. You may copy and distribute this mod as is, without any changes whatsoever. This Mod won't work without a legal copy of the Dawn of War game. to point out that this mod should be used in respect and honour to their efforts. 1.) Do not use parts of the mod for your own mod without asking the head of the team of allowance. 2.) Do not show parts of the mod, screenshots etc. without mentioning it to the Mod team. 3.) Do not ever proclaim to have rights to our mod or part of it. Note that we have the right to call it our own. 4.) Note that with downloading the mod you have no right of using it without a legal copy of the original Dawn of War game. 5.) You have no right to sell this mod or part of it, or use part of it in another mod. 6.) If you like to contact us, for whatever interest you have, simple go to our webpage or forum. variably registered in the UK and other countries around the world. Used without permission. No challenge to their status intended. The browser returns an error when trying to download: The URL timed out. I assume it's the request that timed out, but that's just the message. Also with red background. Likely the file is so old that during one of modDB's changes the old download was lost. However on the 'summary' page is a link for what's meant to be the updated Soulstorm version which I didn't see at first. Steel Legion Mod 1.0 has not been tagged yet.